Hello all! I just joined because I did my first small crochet project last night. It actually started out as a turtle…but ended up looking like a puppy so I added a few little ears. Don’t mind the dust in the photo. Thanks! Yes – My husband says it now looks like a sheep. I’m wondering if I am doing the single crochet wrong…I tried to do it from memory. I’ll have to go look up a tutorial online and see. Sheep or puppy, I like him. Will he get eyes? I’m thinking of sending him to my brother and sister-in-law who are expecting their first baby. And if I do that, I don’t think I’ll add eyes. Although I’d love to learn how to add eyes! 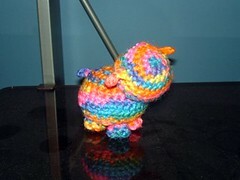 I just finished crocheting another (slightly bigger) turtle pattern from roman sock called Granny Square Tortoise Love. I just have to sew him together and add a few details. I looked at one craft store and they only had BIG eyes. I’ll have to keep my eyes peeled for smaller eyes.